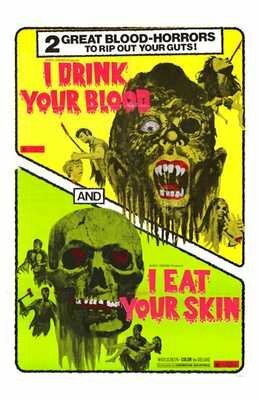 Poster for the Followup to "I Drink Your Blood/ I Eat Your Skin"
It is a powerful, memorable image. And for better or for worst it was the element most readily associated with Planet Terror, and perhaps with Grindhouse as a whole. Considering the disappointing box office take of Grindhouse it just might have been for worst. But I still love it anyway. Matt Bradshaw over at Cinematical recently had a nice article listing his favorite grindhouse flicks. 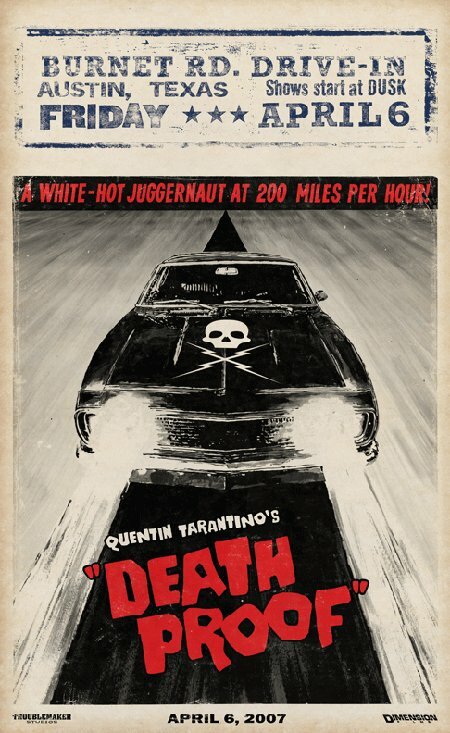 Me being me, I immediately thought “yeah, but what about the posters?” So consider this a companion piece to that article, as well as a way to get yourself in the right mood to see the new Tarantino/Rodriguez double feature coming our way this Friday. You might know Sonny Chiba as Hatori Hanzo, the master swords maker from Tarantino’s Kill Bill. But much before that, he was an action star in Japan. A very mean action star. For example, in this one he plays a mercenary that tries to save a rich heiress from a gang of thugs. That is, he tries to save her after the gang fails to pay him enough money to kidnap her. Nice guy. The poster itself goes for the drawn characters look, which was quite common at the time. You don’t see much of that anymore. Two great movies for the price of one! What more could you possibly want? 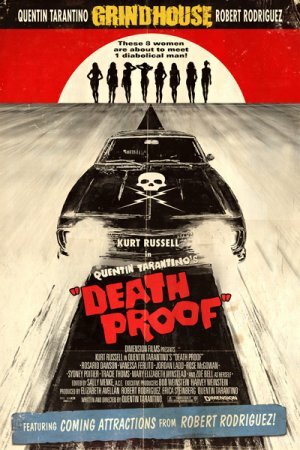 I love the Grindhouse posters. Very different from the clean, bright posters we are so used to seeing. And to my mind they capture the feel of the usual poster for a grindhouse flick, but still manage to look much better then any of the actual posters for those movies ever did. Believe me, I have been looking at a lot of those posters for a feature that should be up tomorrow. They are interesting. Mesmerizing even. But they were also cheap hack jobs, and it shows. Can’t you just see this one as an advertisement in some hidden inner pages of your local paper? Well, perhaps not nowadays. The yellow one is my favorite Grindhouse poster, the one I would want in my bedroom. The look on the actress’s face, the heavy, running, make up. And the mysterious syringe. Just perfect. After having been involved in a car accident a few of months ago I have been a lot more sensitive to horror movies featuring cars. So I guess that is one good thing that came out of that. But even you less sensitive people out there have to agree, that is one mean looking car, right? These two come courtesy of the wonderful FilmIck. Apparently, those are possible posters to be used in English speaking countries were the two films will be released separately. Yeah, that is right, separately. Yes, I think that’s crazy too, but what can I do? 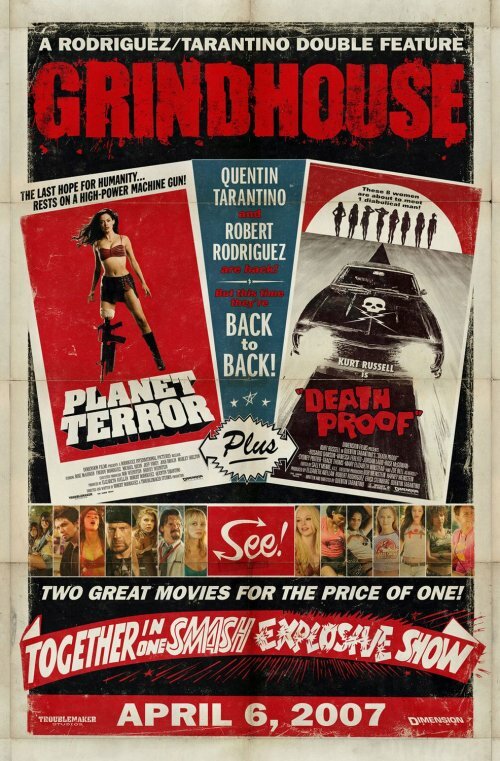 Grindhouse opens this Friday, so get your wallets ready.